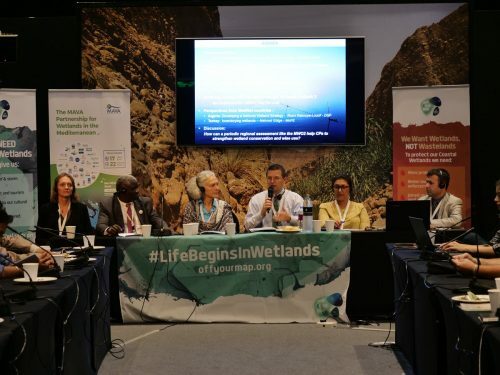 The Ramsar Convention on Wetlands organized the 13thSession of its Conference of the Contracting Parties (COP13) in Dubai, United Arab Emirates, from 20 to 29 October 2018. The Conference focused on the theme “Wetlands for a Sustainable Urban Future”, which highlighted the important role played by wetlands in making cities livable. Once more, the Ramsar COP13 aimed at assessing the progress in the implementation of the Convention, negotiating 26 draft resolutions, and considering emerging issues and priority actions. 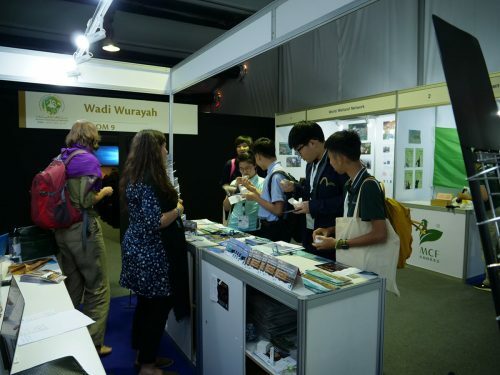 The COP13 was attended by more than 1,300 participants including delegates of the 170 Contracting Parties to the Convention, international and non-governmental organizations (NGOs), experts on wetland-related issues, observers and visitors. The Agora was a space dedicated to the Mediterranean community of Contracting Parties, partners and observers at Ramsar COP13 mounted in the area dedicated to exhibitions. 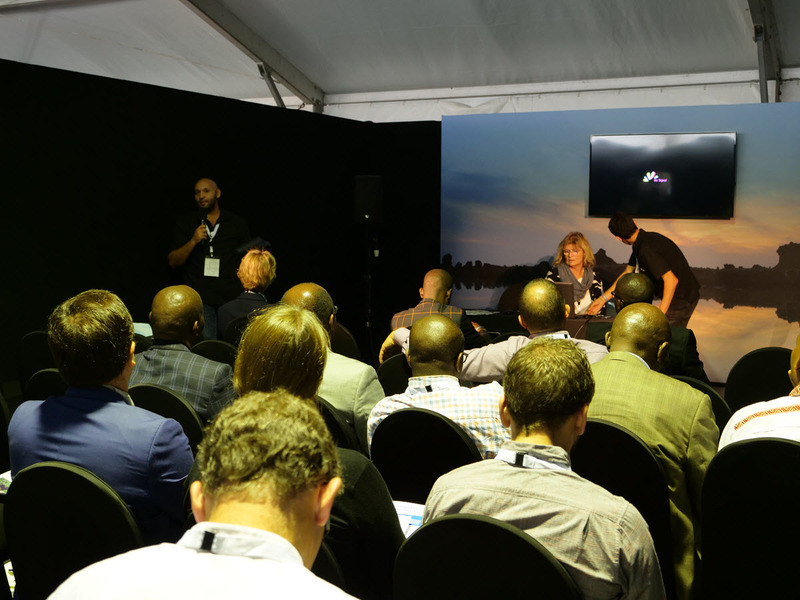 During the entire Conference, MedWet and its different partners especially Tour du Valat and MEDSEA Foundation, were delighted to receive in the Agora people of different ages and nationalities. They were brought together by one idea: loving wetlands and trying to improve their status. We spoke with them and listened to their aspirations and ideas to protect wetlands worldwide. The visitors included delegates from different countries who came to learn about our projects, actions, realizations, and tools related to wetland conservation. 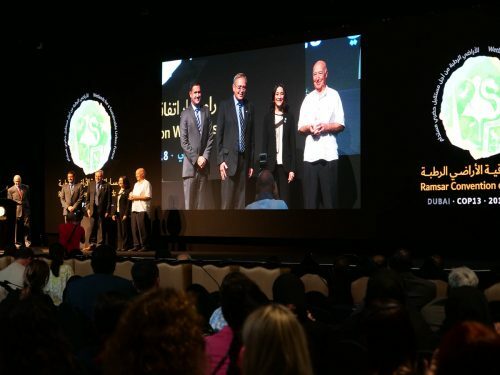 The Ramsar Wetland Conservation Awards 2018 recognized and honored the achievements of several people, organizations and governments from around the world for their efforts in the conservation and wise use of wetlands. On Monday evening, 22 October, the Ramsar Secretariat presented the Ramsar Wetland Conservation Awards, honoring, for wise use of wetlands, the Spanish organization Fundación Global Nature for its efforts to restore the La Nava Lagoon, a 2,200 hectares steppe lagoon that was drained in 1968.The restoration of the La Nava Lagoon is one of the most important milestones in the history of Spanish conservation work. After the recovery, La Nava has become again an internationally important nature reserve and resting place for migratory birds. 225 species of birds have been counted – among them 50 % of the species living in Spain. Since its inception the Fundación Global Nature has conserved and restored a total of 14,000 hectares of wetlands. It has worked on more than 100 wetlands in Spain, eight of which are Ramsar Sites. Read more about the Wetland Conservation Awards 2018 here. During COP13, the Ramsar Convention awarded for the first time Wetland City Accreditation to 18 cities that have taken exceptional steps to safeguard their urban or peri-urban wetlands. These pioneer cities will serve as examples and inspire deliberate actions for other cities towards sustainable urbanization. More Wetland City Accreditations should be presented at the next Ramsar COP in 2021. 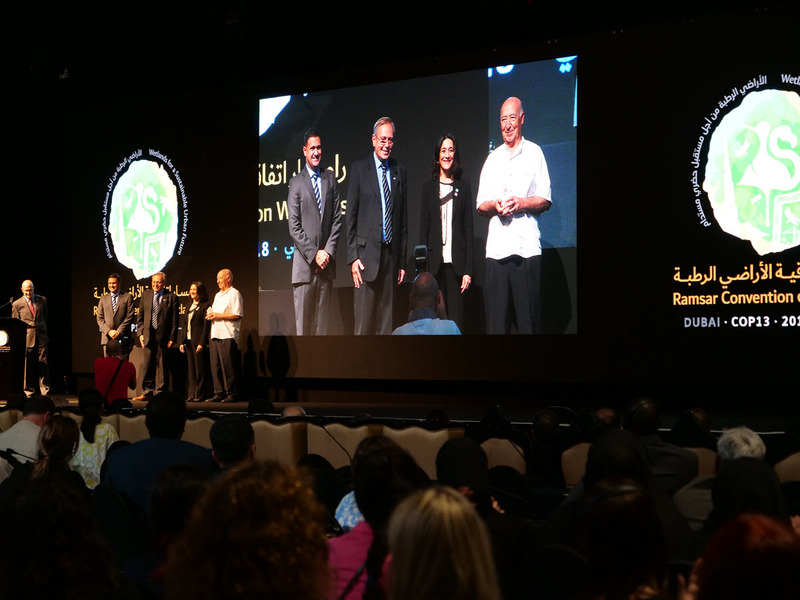 Watch the video of the awarding to the city of Ghar el Melh of the Wetland City Accreditation award by the Ramsar Convention. 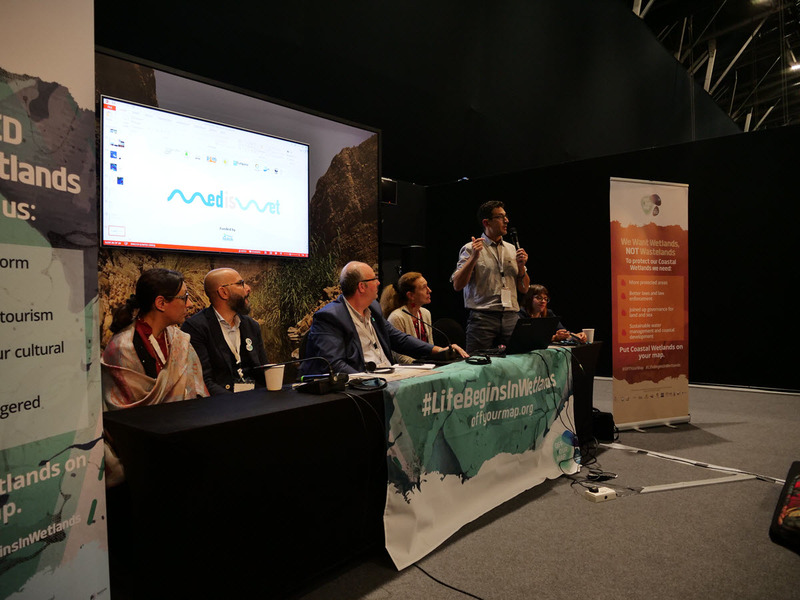 In this context a side event was organised on 26th October about “Wetland city accreditation: a planning tool for sustainable cities, Case of Ghar el Melh” by WWF North Africa and the General Directorate of Forestry of Tunisia. Mr Paul Ouedraogo from the Ramsar Secretariat explained the challenges faced in the process of establishing the Wetland City Accreditation and recalled the lobbying done at the national and international levels until the adoption of the procedure by the Ramsar Convention at the previous Ramsar COP12 in 2015. He also highlighted the important work and support of the Tunisian Government, WWF North Africa, and the MedWet Initiative to this long-term procedure since 2012.Ms Sana Mzoughi from WWF North Africa gave an overview of the creation and the history of the “Wetland City Accreditation” of the Ramsar Convention, a Resolution that was initiated by the Tunisian government through the official representation of its focal point(the DGF), and supported by the Republic of Korea. She also focused on the case of Ghar el Melh, the city which inspired the origin of the creation of the “Wetland City label”. For more information, please contact Sana Mzoughi, Cultures and Landscapes project officer at WWF North Africa at smzoughi@wwfna.org. Download the PDF presentation of the GEMWET project here. 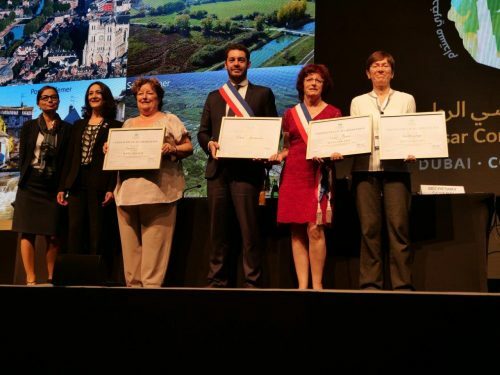 The French cities of Amiens, Courteranges, Pont Audemer and Saint Omer were among the 18 cities that received the Wetlands City Accreditation. Read more about the Wetland City Accreditation Award here. 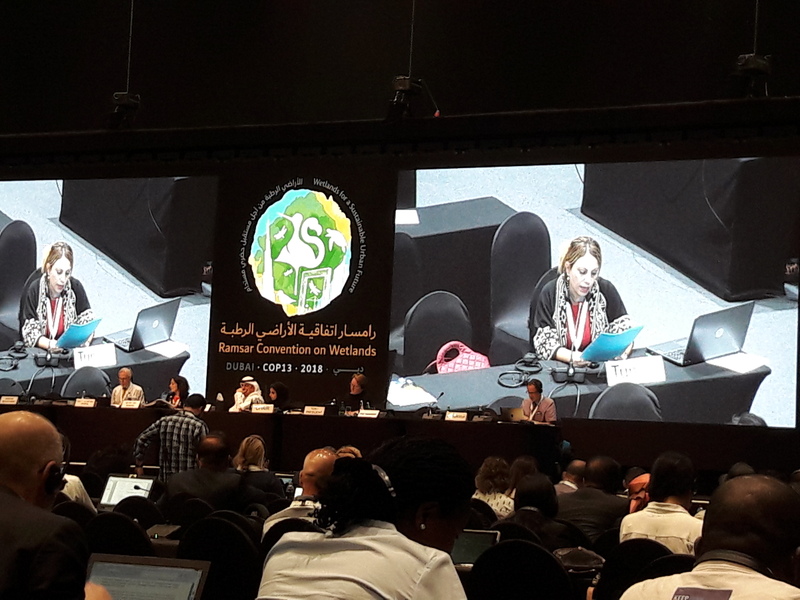 During the COP13, Tunisia, also on behalf of Burkina Faso and Senegal, presented the draft resolution on “Cultural Values, Indigenous Peoples and Local Communities, and Climate Change Mitigation and Adaptation in Wetlands”. The Tunisian delegate highlighted the vital importance of wetlands to human well-being, livelihoods, and food security, noting the existence of economically disadvantaged geographical zones that are particularly vulnerable to climate change. The Resolution was adopted by the meeting. 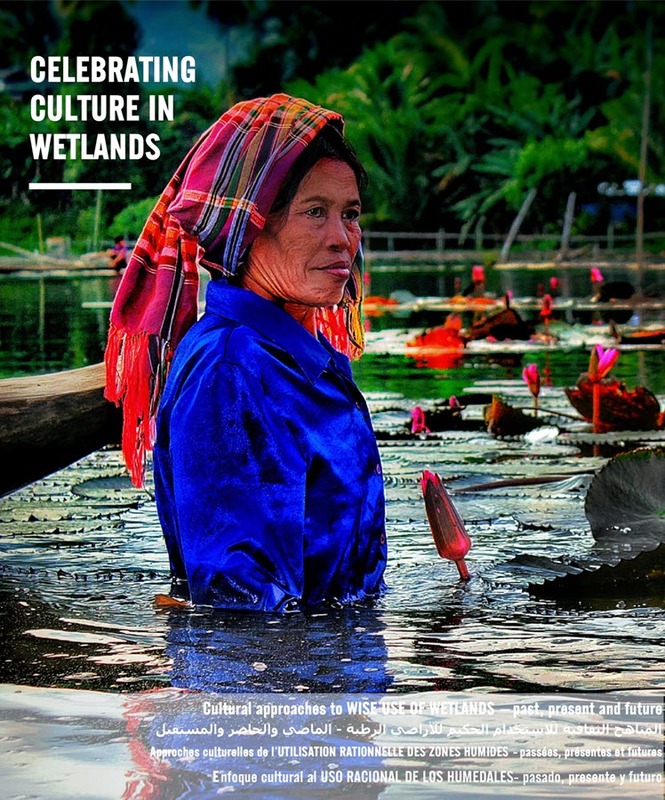 On 23 October, Dr. Gordana Beltram, the outgoing Chair of the MedWet Steering Group, and Chris Rostron from Wetland Link International opened the side event ”The cultural approaches to wise use of wetlands– past, present and future”. The event aimed at celebrating the powerful role that cultural values and communities can play in improving conservation outcomes for wetlands. It also highlighted the achievements of the MAVA funded project ”Conservation of the natural and cultural heritage in wetlands: Global leadership for an integrated approach through the Ramsar Convention”. More information about the side event in the article on the website of MedWet Culture. 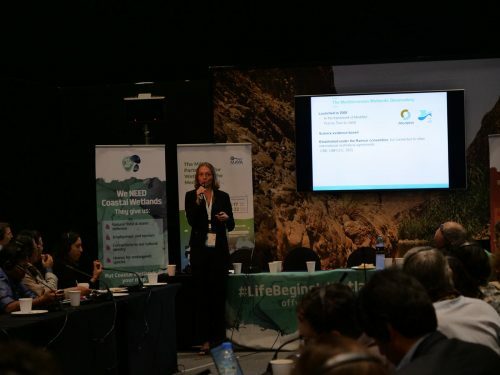 During COP13, the draft resolution on promoting the conservation and wise use of intertidal wetlands and ecologically associated habitats was also adopted. This Resolution is very pertinent for MedWet, which is leading the “Off Your Map” communication campaign, funded by the MAVA Foundation, to conserve coastal wetlands in the Mediterranean region. 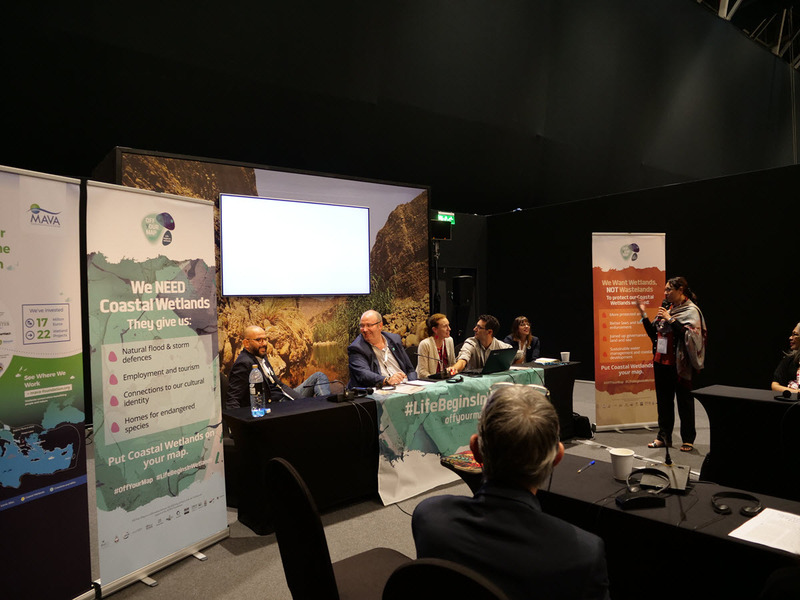 On 24 October, the MAVA Foundation opened the side event “Enhancing the Conservation of the Mediterranean Coastal Wetlands“, organised by MedWet, with an overview of the Coastal Wetlands Conservation Program in the Mediterranean region. Jean Jalbert, from Tour du Valat, highlighted the important support from the MAVA Foundation and paid tribute to the Foundation not only for being a generous private donor but also for mobilizing the Mediterranean community around the conservation and wise management of Mediterranean coastal wetlands. Mr Thanos Giannakakis from WWF Greece presented the Mediterranean Wetlands Island network (MedIsWet) during the side event. He provided an overview on the historical aspects of the project, described its main objectives and focused on the progress achieved on the ground by the 13 project partners. Download the PDF presentation of Thanos Giannakakis about the MedIsWet project here. 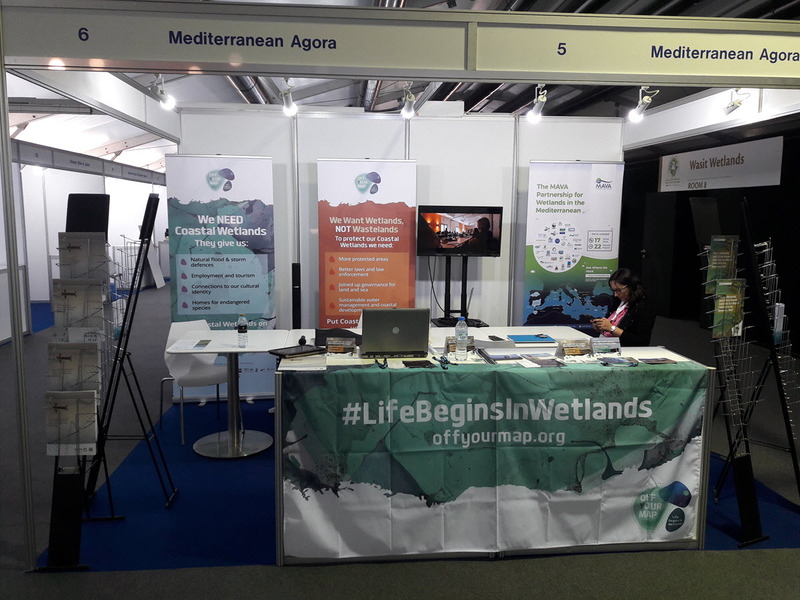 At the same side event, the Mediterranean Sea and Coast Foundation (MEDSEA) presented the MARISTANIS project to protect coastal wetlands in Sardinia, its objectives, and its one-year progress, and focused on the MAVA Foundation initiatives related to coastal wetlands. The project aims to achieve an integrated and shared governance for the six Ramsar Sites of the region and the sustainable management of each of them. Several activities designed to preserve biodiversity, reduce the impact of human activities, and enhance the cultural heritage have been implemented during the first year. The most important result, however, has been the effective engagement and the participation of local actors and the new interest in wetlands in the whole Sardinia region. Watch the video introducing the six Ramsar Sites of the Gulf of Oristano and the Peninsula of Sinis (Sardinia, Italy) involved in the MARISTANIS project. Download the PDF presentation of MEDSEA Foundation about the Maristanis project here. Jean Jalbert, Director General of La Tour du Valat, Gordana Beltram, the outgoing Chair of the MedWet Steering Group, and Paul Ouedraogo, from the Ramsar Convention Secretariat, opened the side event “Monitoring the status and trends of wetlands in the Mediterranean region: the Mediterranean Wetlands Outlook 2” to officially launch the new report ‘’Mediterranean Wetlands Outlook 2’’ on the state, challenges, perspectives and solutions for sustainable Mediterranean wetlands. The Mediterranean Wetland Outlooks are unique reports of the Mediterranean Wetlands Observatory (MWO) functioning under the umbrella of Tour du Valat and the Mediterranean Wetlands Initiative, MedWet. On 25 October, the second edition was launched, allowing scientists for the first time to go beyond a baseline assessment and identify trends over time. The Mediterranean Wetlands Outlook 2 (MWO2) depicted a grim picture of the current situation, with a loss of natural wetland habitats being higher in the Mediterranean basin than the global average: 48% versus 36 %, respectively. This is also reflected in biodiversity with 36% of the wetland species being threatened in the Mediterranean basin versus 25% worldwide. Mediterranean Contracting Parties to the Ramsar Convention have, however, continued their efforts to protect Mediterranean wetlands and have further designated another 660,000 hectares of Wetlands of International Importance (Ramsar Sites) since 2012. During the side event, several countries such as Albania, Algeria, France, Malta, Morocco, Portugal, Slovenia, Spain, Tunisia and Turkey indicated their appreciation for the work undertaken to produce the MWO2. The real challenge now is to implement sustainable management plans and follow the recommendation of the report to use wetlands to make progress towards the Sustainable Development Goals and mitigate climate change impacts. Download the presentation in PDF of the side event of the Mediterranean Wetlands Outlook 2 here. On 26 October, the European Space Agency (ESA) organised a side event “Earth Observation (EO), a game changer for Ramsar Contracting Parties”. The event aimed at informing the Ramsar community on the latest EO developments and on the availability of data sets, methods and tools that can support the development of wetland observatories. These EO data sets and tools were illustrated with practical examples that showcased the effectiveness of EO approaches. The event also contained a story line addressing first the policy drivers (the Ramsar Convention and the Sustainable Development Goals (SDGs)), summarising the existing and forthcoming satellite assets, presenting the new EO global data sets (Global Surface Waters, Global Mangrove Watch), and highlighting national best practices in Albania, Algeria, Rwanda, and Uganda. It also presented a number of EO tools and platforms (GlobWetland-Africa and SWOS), introduced the GEO-Wetlands collaborative framework for international cooperation, and summarised the EO opportunities and challenges for the Parties to the Ramsar Convention, with an outlook of future plans. 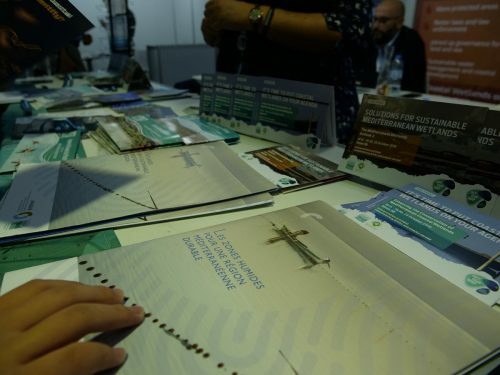 During the COP13, the draft resolution on language strategy for the Convention was adopted with the support of Arabic-speaking countries such as Algeria, Libya, Jordan, Oman, Tunisia, the UAE and others, recalling that Arabic is one of the official UN languages and that the strategy will further enhance public awareness in the Arab region. Ms Hela Guidara, from Tunisia, expressed the support of her country for the adoption of Arabic as a working language of the Ramsar Convention and recalled the important role of the MedWet Initiative in the diffusion of wetland news in Arabic through its social media and its website.